Ryan, great comments on the original list vs just list price. I have a question for you. I know that we can’t predict the market but if you have to chose one statistic that will be a leading indicator for real estate prices, which one will you chose? Hi Jana. Thanks so much. It’s actually really easy to miss the distinction at times between SP/LP and SP/Original LP. For years I had no idea of the distinction to to be honest. The default setting in MLS when running a CMA is actually SP/LP, which doesn’t really tell the story very well in my opinion. I’ll have to see if that can be changed in my settings (hopefully). One stat as a leading indicator? That’s like asking me to choose my favorite kid. 🙂 I’m kidding. Actually though, there is some truth here since there really isn’t just one end-all stat to watch. Some people preach the stock market, Case-Schiller index, the luxury market, or some other metric or index out there. The thing is though the market is made up of so many moving parts that it’s not easy to boil things down to one thing. In short, there are many metrics that are key. This is why I love the multi-layered cake analogy http://sacramentoappraisalblog.com/2013/09/11/the-multi-layered-cake-analogy-in-real-estate/. With that being said, if I had to recommend some stats to watch in a local housing market, I would say to pay close attention to changes in monthly housing inventory, monthly sales volume, and the sales to original list price. When these things begin to really change, we’ll likely see the change show up in prices. This is why we don’t necessarily have to just watch prices. While that’s important, it’s maybe more interesting or telling to think about other factors that are maybe driving prices to change. Moreover, when the market changes we’ll hear the real estate community talking about the change or how properties are no longer selling. Thus what we hear on the street from agents, appraisers, loan officers, title/escrow, etc… can mean something. Thank you, Ryan! I usually look at the inventory and sale to list price ratio. I learned something new today. I have to look at original list price. Right on Jana. That’s great to hear. And don’t get me wrong, it can still be telling to look at SP/LP, but my sense is SP/OLP might tell us more of what we want to hear at times. If any onlookers love SP/LP though, let’s talk shop. What do you love about it? Why do you prefer it? Ryan, enjoyed the article and your market stats as always. Your point about the list to sales price percentage has bugged me for years for the very reason you illustrate. Thanks for bringing the issue to light for others. Thanks so much Chris. I appreciate it. I’m glad to hear you are bugged about that. 🙂 There has to be a way to change the CMA to show SP/OLP. It seems like we’d get a better picture of the market that way. I checked briefly but couldn’t figure anything out in MLS. If someone knows how to do that, speak on. Whatever the case, this underscores how important it is to know how to navigate through the numbers and metrics so we can explain the trends. Sometimes there are metrics we simply have to throw out too rather than give them weight. Thanks again Chris. Great example Ryan of how the sales price to list price statistic can get distorted. In my market, I find a similar problem with the days on market statistics because of the practice of pulling properties off the market just long enough to reset the days on market calculation and relisting. Tremendous example Gary. This is exactly why we have to know how numbers are being reported in MLS. CDOM clearly is the real trend. My MLS added CDOM around 2006 or so I believe. It’s amazing how we can pull a CMA and start looking at SP/OP and DOM, but we might not really be getting the full picture. Thanks Gary. Great article Ryan. Gary made a great point, and one that I see in the Birmingham area as well. That is the practice of pulling the home off the market and then relisting so the DOM is reset. I tell agents in my area that the statistics that the MLS provides is only as good as the data that is fed into it. Same thing with gross living area and price per square foot. The old saying of “garbage in, garbage out” is appropriate here. Yeah, if we can’t trust the stats, that’s not good for anyone. It’s tempting in real estate to want to beef up the numbers, but we have to let the market do what it does, understand it, and then explain it. I get where agents are coming from in wanting a fresh listing because there are likely marketing benefits to that. But it’s just too bad if that ends up impacting data in the neighborhood (especially if this happens on a mass scale). Data matters and if we’re not careful we can really screw things up. On a related note, one thing that is starting to happen more in my area is a property getting into contract higher than the list price and then the agent changing the active listing to the higher amount before the status is changed to pending (at the higher amount). Previously it was normal for a property to go pending at the original list price and then when it closed we would see the higher price listed if it actually sold at that level. I’m not sure if MLS changed their rules, but this has really emerged quite a bit more over the past year. This is sort of a nod to appraiser that the property is in contract at a higher amount, but what does it do to data? If this is not done for all properties in the neighborhood, it can maybe lead to funky stats when looking at all the pendings. This could mess with the SP/LP ratio too on a CMA as it would essentially make the SP/LP ratio look more watered down. Moreover, this is not equally applied in the case when a property gets into contract lower. My question becomes, what reason is there for doing this only when it is higher? Is it about influencing an appraisal or is there a different reason? Good work again Ry Guy. The average property listed right now in Sacramento is for the most part dog exrement with a pitched comp shingle roof and a spendy price tag. The quality of inventory is offensive. There I said it. I am actually offended by the new listings coming online and I don’t think I am alone. I cannot believe what people are paying ‘top dollar’ for out there. Can I ask how on planet earth appraisers are allowing some of this to fly? I’ve been exclusively a cash buyer for about 7 years now so this is now quite unfamiliar to me. Back in the day I remember astute appraisers hammering values and really nitpicking deals they were underwriting. 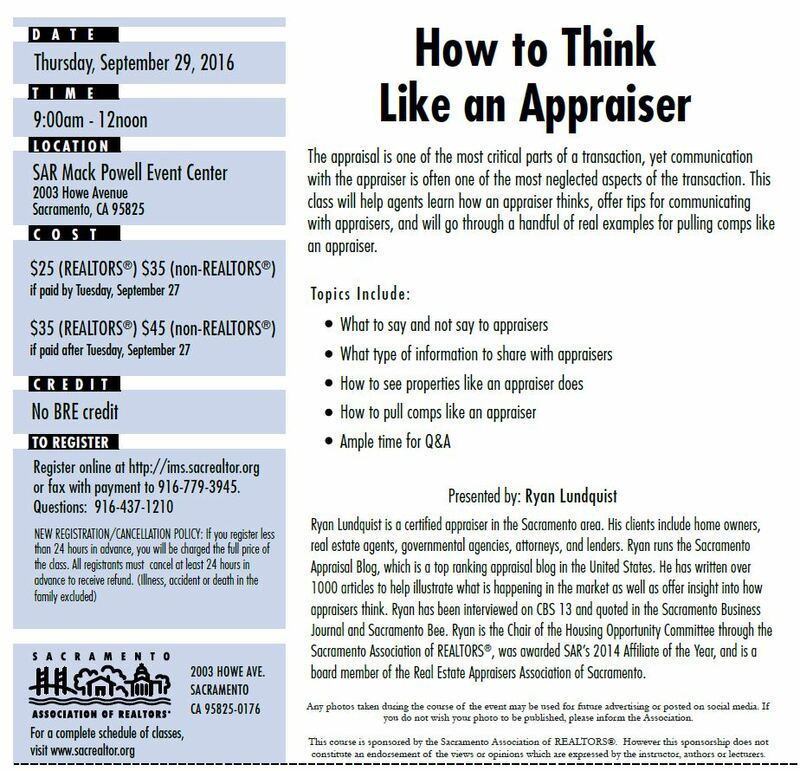 How can appraisers today truly be valuing this stuff without looking the other way? They must simply be going off comps?? I cannot figure out how on earth these deals are financeable unless appraisers are simply building value based on inflated comps. It is truly getting nutty out there. The quality of deals closing relative to their frothy prices is far worse to me than 2006 now. I really mean that. Deals are that bad in my opinion. I cannot believe this is happening again. I would love to hear from someone who really thinks this is organic sustainable growth and not a tulip craze. Actually, I wouldn’t because if you do then your opinion is of little value to someone with brain synapses. Hi Mr. Myagi. Thanks for the comment again. Sorry for the delay in response as I’ve been out of town visiting family. It’s hard to respond to your thoughts because I don’t have a specific situation in front of me to say whether a particular property is wrongly inflated or not. Right now the market is higher though and people are willing to pay those prices in many cases. The same was true in 2005. Some would say, “Values were way too high,” but then you’d have multiple offers at those list price and the comps supported a value that high too. Granted, if there is only one inflated comp we shouldn’t be using that one for the basis of the value. After all, one sale doesn’t make or break a market. To be fair, many appraisers did turn a blind eye in 2005, but these days hopefully they are doing a better job. There are still appraisers out there who will “hit the number” (contract price) no matter what. But hopefully appraisers are doing better overall. In all honesty that kind of sounds like there is no governor whatsoever again. In other words, appraisers are just going off comps, and buyers are buying whatever banks lend, and the circle goes round and round. It should be a bit alarming that there are no ‘whistleblowers’ so to speak. An appraiser just says, ‘well I’m going off comps so my conscious is clear.’ Prices are massively overvalued, we all know that, but very few of us are honest about it. This reminds me eerily of ten years ago. Slightly different, as is every market cycle, but the apathy about soaring prices built on no underlying fundamentals whatsoever is frightening. It is a ‘look the other way’ scenario again. Pay no attention to the man behind the curtain. Every day this continues my prediction of a larger collapse becomes more cemented in my mind. I’m not suggesting we need intervention on a regulatory level, I believe in the free market. But we do need more independent thinkers in the real estate community. The real estate professionals I know simply refuse to focus on anything but the next immediate deal. I did the same as a broker on some level so I get it. But my lord these arbitrary soaring values should be alarming more people. Bubbles build quietly though. Thanks. I appreciate your take. Here’s the thing though. Appraisers are tasked with measuring the market. Whether the market is inflated or utterly collapsing, an appraiser’s job is to determine market value. What is the most reasonable and probably price a group of buyers would pay for this property? Despite values being higher, buyers are willing to pay these amounts. Appraisers aren’t a brake pedal for the market or even a gas pedal, but rather a measuring stick. In some senses of course appraisers are like umpires because some properties simply get into contract too high. Appraisers do need to explain the market and support what they say the market is doing (increasing, stable, declining, etc…). For reference, I describe the market in depth in my reports. I talk about the collapse of values and then the market that increased exponentially in 2012 and 2013 – mostly due to cash investors and historically low rates. I talk about the slower growth these past couple years and the ultimate need for the economy to drive the market. My closing statement is something to the effect of price growth not being sustainable over the long haul. Those are fair points. Can’t argue with that. And I don’t think you need a specific deal in front of you to underwrite..pick almost everything listed! 🙂 Price growth from artificial low supply and distorted monetary policy should alarm anyone who is supposed to be vetting deals for institutions that lend money. But it isn’t, because people have to feed their family.